95-301-146. Yup it's him. The Comic Book Store Guy from the Simpsons - complete with priceless back issues of Radioactive Man under him arm. Printed on pre-shrunk 100% cotton black tee. Retired style. Only adult size Small left in stock. 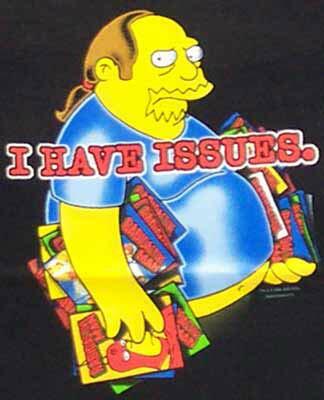 Funny Simpsons Tshirt. Yup it's him. The Comic Book Store Guy from the Simpsons - complete with priceless back issues of Radioactive Man under him arm. Printed on pre-shrunk 100% cotton black tee.